It's funny how sometimes meaningless conversations or moments can turn into inspiring ideas down the track. It was a little more than a year ago that a random conversation with my trainer spurred an idea that has now finally become this project. We were talking food ideas and he suggested looking into some global recipes, adapting them to suit my tastes and hopefully finding new foods and flavours along the way. Being somewhat an all or nothing kind of girl, I figured: why not try them all? So that's the plan. Travel the world alphabetically, cooking a dish from each country. I'll generally be adapting recipes to suit a paleo/primal blueprint - but it won't be a strict rule. First, a bit of background. My own relationship with food was pretty destructive for a large part of my life. Since making the attempt to recover from an eating disorder a few years back I, to my surprise, learned to find food, flavour and the creation of meals exciting. Dishes became more than fuel or calories, time in the kitchen became relaxing and I found real joy in searching recipes and meal ideas. Still, it's easy to get stuck in a rut of easy and safe foods. There are countless flavours to try and battles to be won. There's still a long way to go. So I'm sending myself on a culinary journey of self-exploration. The only rules I'm making for myself are that I'll travel the world in alphabetical order, cooking a dish from all 196 countries (yep, I'm counting Taiwan). The dishes don't have to be the national dish or even a full main meal. They just have to be something. I'll be tackling a new country at least once a week. I'm hoping to continue to find joy in discovering food and flavours, to force myself out of various comfort zones and to develop and understand my own relationship with food, while learning more about global relationships with food, flavours and tradition around meals. As an added bonus, maybe my plating skills may improve somewhat, too. It's just one of many reasons I never became an award winning chef. When it comes to putting food on a plate – let's just say my natural talent isn't immediately apparent. So until I've mastered the art – just trust me. The food probably tastes a whole lot better than it often looks. I'll be spending a lot of time in my kitchen, but I'm hoping that along the way I can spend time in others' as well. Learning techniques and traditions passed through generations and cultures. While I'll make an effort to adhere to a lot of traditional ingredients and methods, at times recipes will be heavily adapted. I'm definitely down for organising a pig roasting get-together among friends when Serbia arrives, though I imagine I'll pass on frying up a guinea pig when Peru rolls around. However it pans out, though, I'm imagining an exciting,and sometimes confronting, journey of self-dicovery though food. One dish at a time. I'd love to receive tips, ideas or simply your own food memories - wherever it is that you're from. When it comes to food, I learned a lot from my mum. From a love of fresh seafood to comforting memories of fish and chips on a Friday evening after an afternoon tackling the waves at Pukehina beach. One thing that was passed down and stuck with me from a child is a dislike of overly-cooked vegetables. She grew up being presented with boiled-beyond-recognition greens and never cooked that way as an adult. In turn, I grew up with a love of fresh and crunchy, and have been lucky to have grown up in a place where fresh and crunchy is widely and easily available. 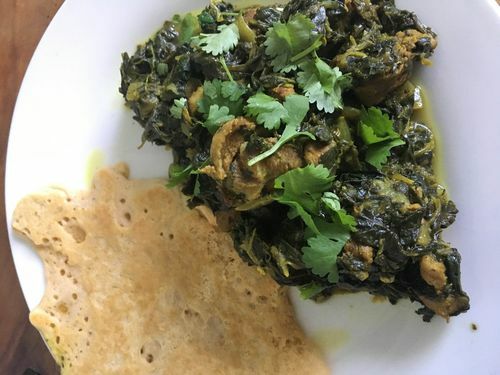 So the idea of a spinach-based qorma (stew) was a challenge in itself. In fact, Afghanistan as a whole proved a challenging first meal for a few reasons. Being a hot, dry, landlocked area, Afghanistan has a cuisine based primarily on rice, barley and wheat dishes, with root vegetables and legumes often making up the difference. Meat, from what I've read, is generally preserved for special occasions. If you're looking to adapt to a primal diet, wheat, rice and legumes seem, from the outset, a bit of a logistical nightmare to navigate. The country's national dish is Kabuli palaw - a pilaf made with rice, lentils, lamb, carrots and raisins, flavoured with plenty of earthy spices. And then, while searching through recipes, something clicked - Our western obsession with restriction or paleo and primal living has become almost necessary - not because it's best, but because we have such a tendency to drown our food in sugar, highly processed carbs and comfort through convenience. A bit of time in the kitchen, eating out of markets rather than boxes isn't a concept lost by those that don't have cheap food on demand with a quick dial of a phone. That's my theory, anyway. I'm only one country down, there's plenty of time to put that hypothesis to the test. Afghan meals seem to be an affair of love, with time and care spent in the kitchen. Sweetness, from what I gather, is created through fruits like raisins and prunes. Meal-times feature a number of dishes - often a rice dish flavoured with spices and fruit, a qorma or other "main" dish and often naan or other bread-based dish together with yoghurt,chutneys and other bits and pieces to add flavour and nourishment. Family-style dining in its truest form - not something saved just for special occasions. Eggs and proteins don't come cheap so aren't the main components of meals. Wealthy families eat multiple rice dishes a day. Royalty and celebrational feasts will feature multiple rice dishes. Sweets and candy are treats, rather than the every day norm in most households. Dessert is often fruit - pomegranates and grapes being available in abundance. Eating out isn't common. Where the western world has adopted the idea of having someone cooking and cleaning as perfect for celebratory meals, in Afghan homes it seems almost as if the preparation and cooking is part of the celebration in itself. While looking into the cuisine of Afghanistan, I found a wonderful site - Afghan Culture Unveiled. Within it, Humaira Ghilzai, co-founder of Afghan Friends Network and gender equality advocate,blogs about Afghan food and culture. Numerous times she recalls meals that would last for hours, after having been prepared for more than ten. It got me thinking about my own food memories growing up. I have some great ones – my dad was a master of curry, and my mum could fillet and cook fresh fish like a pro. I don't recall many moments of spending time in the kitchen with my parents though. It's not necessarily a bad thing, just a thing of circumstance. My brother and I had our sports. Mum and dad had full time jobs. At some point food would be cooked and it would get eaten. We had some great family moments, but few of them took place in the kitchen. Birthdays and celebrations were definitely a restaurant affair though. And at some stage restaurants became a regularity rather than a treat. I think there's a lot to be said for culture and recipes being shared between generations within a kitchen. One thing I realised pretty quickly was just how easily I'd got into a routine of speed and convenience when it came to my own cooking. I was excited about spending an hour or more in the kitchen actually creating again, but before I began it did dawn on me that throwing together a quick salad with a piece of chicken would be a lot quicker, with a lot less to clean up. There's plenty of time for quick and easy though. The US perhaps. Even still, I felt like I was cheating myself a little. Like the first country of this project should be a feast of pretty mammoth proportions. That I should be spending hours making sauces and chutneys and amazing rice platters and filling the dining table with enough food to feed a large family with leftovers to pack away. Not today though. In fact, I decided to skip the rice component altogether. I did, however, try a recipe for paleo "naan" that I'd seen a while ago in a recipe book by Rachael Devich - Eating Clean, Living Paleo. I've never really trusted paleo versions of these types of things. All too often they don't come close to resembling the original inspiration. A nice surprise then, that a simple mixture of arrowroot poweder, egg, baking powder and oil thrown in a frying pan tasted pretty much how I remember naan to taste. The chosen dish itself? Sabzi e Goshte. Basically slow cooked spinach with lamb. Apparently a common dish in Afghani households, often without the meat (the vegetarian version being Qorma e Sabzi). Having pretty much fallen for Humaira's tales of Afghanistan, I found the recipe on her site and got to work. The spices were things I am used to and love – onions (onions are a big thing in Afghani kitchens – I'm yet to find a qorma recipe that doesn't use them as a base) and lamb are browned before being simmered away with water and turmeric, ground coriander and cumin – immediately giving the kitchen a real homely, comforting smell. A while later a LOT of frozen spinach with a bit of lemon juice is added before cooking down until everything is tender and well-stewed. The end result? A kind of brownish green thick stew. The cooked spinach smell was pretty strong, and to be honest, a little off-putting at first. That whole slow-cooked vegetable adversion was tougher to tackle than I'd imagined. I surprised myself though. The flavours and spices definitely had that earthy ethnic comfort aspect. The "naan" was fun having not eaten one in a long time and I have a mountain of leftovers (which, if I'm totally honest, will be adding more lemon juice and a few crisp,fresh vegetables to - simply to cut through the richness). The dish is usually served with yoghurt which, in hindsight, would have gone a long way in cutting through some of the heaviness of the meal. I'd have loved to have seen how it would have turned out had someone that had grown up making it had created it instead. The verdict? Far less of a failure than I half-expected my creation to be. It wouldn't be a first choice for a last meal, and from what I've learned, I think I'd get incredibly homesick for light and fresh if I spent a lot of time immersed in Afghan culture. But I've officially started, which is the main thing. And I'm looking forward to returning to the Middle East as this project continues to see just how much more adventurous I've become. One dish down. Just 195 to go. I'm really sorry to hear that Nat - it's definitely a long and painful road. I'm sorry the both of you are having to travel it - but also amazing that you're there with her through it. I'm not too sure about inspirational - I still struggle a lot! But have discovered that learning to love and be excited about food is certainly possible. I'm hoping this project will help extend the comfort zones a bit more, and if someone can find hope in my ramblings, too - then that's more than I could have hoped for :) Wishing all the best for your daughter. Awesome idea Amberleigh and I'm looking forward to your discoveries. Sometimes the hardest part about cooking is thinking of what to cook and you now have a plan for the next couple of years :). Sorry to here about a eating problems. Finding a reason to cook actual food sounds like a really healthy approach - my guess is you'll find a lot of countries that rely on rice/corn/wheat as primary calories with whichever vegetable is in season. Hopefully your paleo/primal diet is not too strict and you can allow yourself some flexibility. When you get to The Netherlands don't use whitloff (aka bitter endive) - it's disgusting and is my worst memory of pushing food around a plate as a child. Instead make some croquettes. The USA will have lots of options but I'd be tempted by Southern BBQ, slow cooked beef brisket can be amazing. Hawaiian Poke is a different option for the US and probably healthier :). Oddly, although it isn't exactly a healthy long term choice I've found trying doughnuts in different countries is really interesting. I never realised how many different types of doughnut there are. More recently I went through a period of trying to get dinner ready in 40 minutes or less: I didn't want to spend hours in the kitchen after working all day. I've amassed a repertoire of dishes that fit that description, and even if I'm not so strict about that 40 minute limit anymore, it's rare that a weeknight dinner takes longer than that to prepare. If you're looking for a Malaysian dish to try, you're spoilt for choice. It's a country that's had fusion cuisine for literally centuries, a mix of Malay, Chinese, Indian, English, and Portuguese cultures all contribute to the melting pot. Restricting the selection to something more paleo does limit choices but there are still many to choose from. You could try a Chicken kerabu which is Nonya spicy chicken salad. One of the ingredients is wood-ear, a brown fungus that also grows in New Zealand. Useless trivia: we used to export wood-ear to China. - Used Lamb shoulder chops, and cut the meat off the bone before cooking. - Used fresh spinach instead of frozen, but didn't need to add any extra water (but did leave it wet after washing it). - and unfortunately, I forgot to add the yoghurt before serving. Served on brown rice, with broccoli and cheese on the side. Considering that spinach is not a vegetable that is ever purchased in this household, (I personally dislike it), the meal wasn't bad. The spinach taste didn't come through at all, and it was a nice stew. Ranked out of 10, was a 5 and three 6's. Miss found it a little too spicy (though not enough to warrant going to the effort of going the fridge to get the yoghurt).